When I was much younger–perhaps 12 or so–my grandpa got me a book called “Do Penguins Have Knees?”. It was an odd little book that asked a bunch of weird questions and tried to answer them. It was moderately interesting. I think I sold it to the used bookstore a while back. 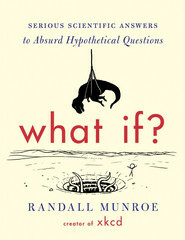 What If?, by Randall Munroe, is what that book was trying to be. I don’t usually read non-fiction, unless it’s a textbook. There have been relatively few non-fiction books that I have actually enjoyed, everything else has been, while perhaps interesting and informative, often dry and boring. This book is not dry. This book is not boring. THIS BOOK IS AWESOME. The book is written as a series of utterly ridiculous questions, such as “What would happen if you pitched a baseball at nearly the speed of light?” and the answers are scientifically researched and thoroughly thought out. But the way they are presented is pure awesome. Munroe’s managed to create a blend of his signature stick-figure faceless comics (If you do not read xckd, you’re missing out on life.) and utterly hilarious comparisons that nevertheless make sense. One or two of the questions are not quite as funny. There’s one question in particular, the one concerning soulmates, that made me sit back and think hard about my life, about humanity. I didn’t see this as bad, though, as he still answered the question thoroughly and in a very interesting manner. Besides, what’s a good book worth if it doesn’t make you re-examine your life? The book itself is a work of art, on a scale I’ve rarely seen outside of special editions of books–and the Stormlight Archive. There are full inside cover illustrations, as well as an illustration on the physical cover of the book, *and* the dust jacket. Seriously. Take the dust jacket off and look at it. In conclusion: Since the invention of the book, there have only been five books that were rated the most brilliant, the most hilarious (Alcatraz 1-4, Hyperbole and a Half.). This one left them all behind. 5 out of 5 stars. GO READ IT.